A federal judge June 12 denied a request submitted by Mick Mulvaney, acting director of the Bureau of Consumer Financial Protection, to stop the small-dollar lending market rule from taking effect. SAN FRANCISCO – California Attorney General Xavier Becerra today announced a settlement with Balboa Student Loan Trust (Balboa) that will provide $67 million in critical debt forgiveness and other much-needed relief for the 34,971 Californians who took out private student loans to attend Corinthian Colleges (Corinthian). 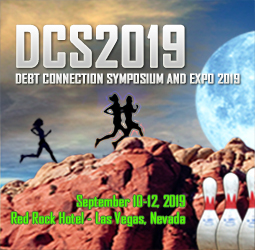 Mike Rogers of ACI Worldwide takes on the topic of Man vs. Machine – The Future of Collections at Debt Connection Symposium & Expo, on Friday, September 7th. The Debt Connection Symposium & Expo will be held September 5th – 7th at the JW Marriott in Austin, Texas. Credit card debt statistics speak to the financial health of American households. They can also foreshadow over-borrowing bubbles, changes to lending standards, and other trends with the potential to impact our wallets. That’s important because the latest news may seem encouraging, but the complete picture is not pretty. Minneapolis, MN – CenterPoint Legal Solutions, a leader in skip tracing, non-performing judgment programs, litigation and ancillary legal services is moving offices this month to facilitate its current and future expansion. CenterPoint has seen an increase in business over the last several years from a combination of increased market share from existing clients as well as new client programs. In order to maintain the quality of service that its clients are familiar with, it was time to move to a larger space in order to increase capacity of scale. Mick Mulvaney will seek a 20 percent cut in funding for the Consumer Financial Protection Bureau, the agency he leads, to bring funding back to the 2015 level. “I’ve asked them to run through the experiment of reducing spending by 20 percent," Mulvaney said of his staff Tuesday. "And we’re very close to finalizing that." Vendors are shipping Android devices with open port setups that leave countless products open to attack. The port, 5555, is at the heart of an Android feature called Android Debug Bridge (ADB). KANSAS CITY, Mo. (AP) — A Kansas City payday lender has been sentenced to 10 years in prison for an illegal $220 million scheme to rip off borrowers. The Kansas City Star reports that a New York federal judge ordered the sentence Tuesday for 73-year-old Rick Moseley Sr. He was convicted last year of racketeering, aggravated identity theft and other criminal charges. The Debt Connection Symposium & Expo will be held September 5th – 7th at the JW Marriott in Austin, Texas. The “Winning TCPA Cases” roundtable is on the schedule for Thursday, September 6th, from 3:30 p.m. to 5:00 p.m. Roundtables are 30 minutes each. Choose your three favorites to join during this educational segment. The Federal Trade Commission has released its final agenda for a June 25 workshop in Chicago that will examine scams involving cryptocurrencies. Andrew Smith, Director of the FTC’s Bureau of Consumer Protection, will give opening remarks at the workshop followed by three panel discussions. The first panel will provide background on consumer uses of cryptocurrencies. A second panel will examine different types of cryptocurrency scams. The last panel will discuss enforcement approaches to combating cryptocurrency scams, including law enforcement actions taken to date and challenges in effective enforcement. Waltham, MA – June 12, 2018 – CallMiner, the leading platform provider of award-winning speech and customer engagement analytics, announced today the details of its hosted events and activities as an exhibitor at Customer Contact Week 2018. CallMiner will host a Master Class Workshop, a Meet the Customer event, and Demo Theater Presentations, as well as the always popular CallMiner Moscow Mule Reception. Cherry Hill, NJ- June 5, 2018- James Beck, the new Chief Operating Officer at MRS, is a seasoned collection leader with over 20 years of experience. Prior to joining MRS, Jim ran the Operations for 13 years at Associated Recovery Systems, Inc. as well as the Operations and Analytics at Circuit City Stores, Inc. At MRS, Jim will lead the Operations, Quality Assurance, Training, and Customer Experience teams. The operators of a Los Angeles-based student loan debt relief scam have agreed to settle Federal Trade Commission charges that they falsely claimed to be affiliated with the Department of Education, charged consumers illegal upfront fees, and collected monthly fees they falsely claimed would be credited toward consumers’ student loans. LIVONIA, Mich. (June 7, 2018) – RevSpring is pleased to announce the appointment of Cheryl Kananowicz as the Vice President of the Financial Services division. Kananowicz brings more than 20 years of sales, customer experience and senior leadership expertise in technology-based services solutions. Her deep industry knowledge and passion for the customer experience will benefit RevSpring clients as she leads the sales, relationship management and marketing teams.